I'm not a big fan of candy bars but I do like to melt my own chocolate and make stuff. 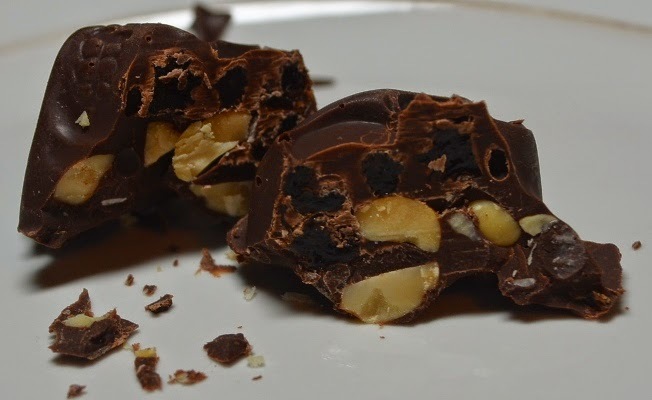 For this, I melted dark chocolate, and added chopped unsalted peanuts with organic raisins. 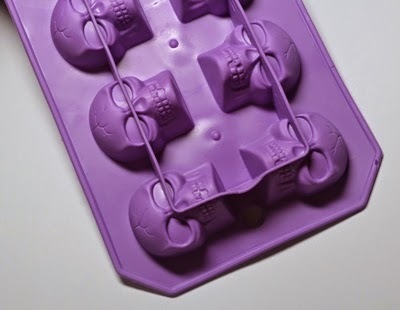 Filled the skull trays, set them in the fridge and waited. 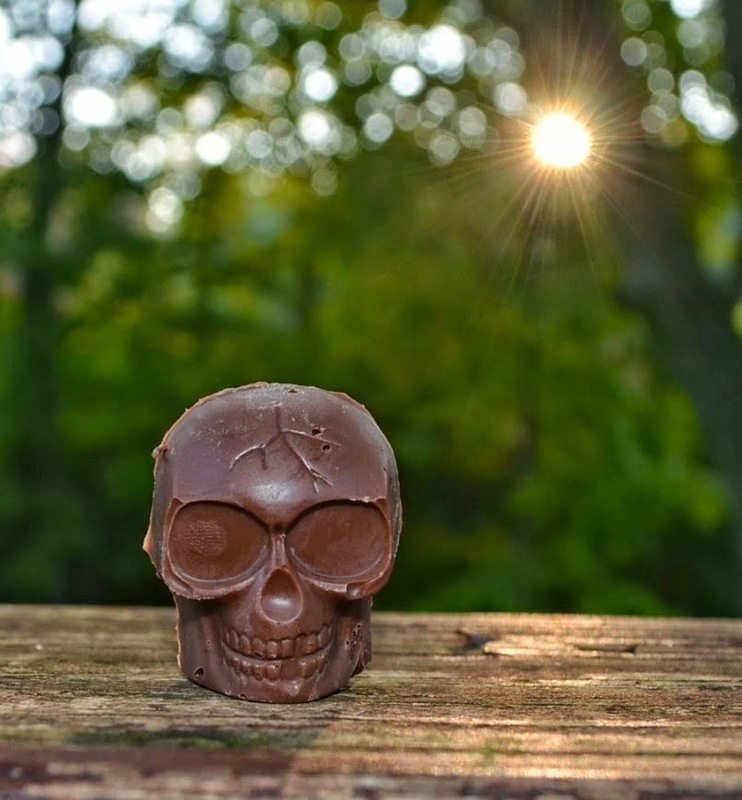 Below is an older picture of a chocolate skull but below that is today's skull, cut with a knife to show the innards. At first I thought I added to much nuts and raisins but after my first bite, I was happily proven wrong. Meanwhile, I got a lot done on the Lemon Tart Room yesterday. In fact, I slept so sound that I was at my desk this morning by ten to six. Made Tim and I a nice breakfast of Hungarian Krumpli (potatoes), with a side of eggs, ham, Feta and homemade rolls with good butter. All in all, a good morning. But now, I'm headed offline to sit on the couch and sort coupons, with my left leg raised and rested. You Boogersbutts take care and as always, boogie boogie until you can't boogie no more. 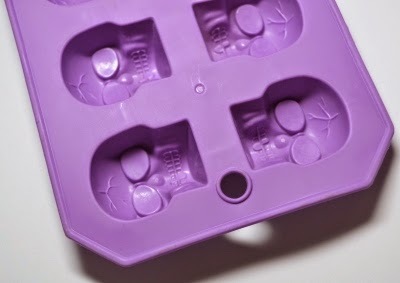 PS: The skull trays were bought at the Dollar Tree, but any plain (or fun shaped), ice cube tray could work as well. The first go, I used a paint brush for the skull layer, to make sure I could see the detail. But then my brush sorta crapped out. The skull bar is cool. No raisins for me though, please. Not for you, eh? But then you haven't had chocolate in what? You said I think two years. I saw that at the market but haven't tried it yet. Yes, these would go good with coffee. And so fun to make. Thank you. I made them myself. You got it. By the way, I'm enjoying your Whatever Wednesday posts. I'm not a chocolate candy bar fan either but those look yummy. As long as something has nuts and raisins in I'll like it. Most are too sickly sweet for me. I'd rather have rice krispies in my chocolate. Leave the raisins and nuts out, please! :) Still, those look pretty cool (and like too much work for me -- haha!!). You're killing me on the too much work. Please pass one this way, they look great! Sure thing. We've got plenty. That's so cool. And it looks YUMMY! I'm flattered that you have approved of my suggestion to call it the "Lemon Tart Room!" Although yes, *sigh*, boys will be boys, eh? Oh yeah, I love the idea. Great name. Thanks. Yes, stinky boys will be boys. Thanks, Carol. Yes, I rested all morning, watched I LOVE LUCY, and now I'm prepping for the market. And wow, 24 books for your buddy. That's impressive. Cheers and boogie boogie. They came out super! Oh, I bet they taste dreamy. This delish concoction seems doable to me - no baking, YES! These look real good. By the way, I'm available for tomorrow's breakfast. Any leftovers? - LOL! Cheers!! They were real nice. I went with the darker chocolate to balance the sweet from the fruit. We gobble up breakfast but if you come by early tomorrow, we'll have more. I sucked at your quiz today. Though it was fun to read them. I look forward to seeing the answers. I have one left. You may have it. O.M.G. Those skulls looks fun, but the innards made my mouth water! - And I'm not even a raisin fan. They were so fun. Think of all the neat combinations. Even a white chocolate raspberry or white chocolate cranberry. Or maybe a lemon sort of candy that's creamy and bright, but in the shape of a skull. That candy looks very tasty! I snacked on them all day. 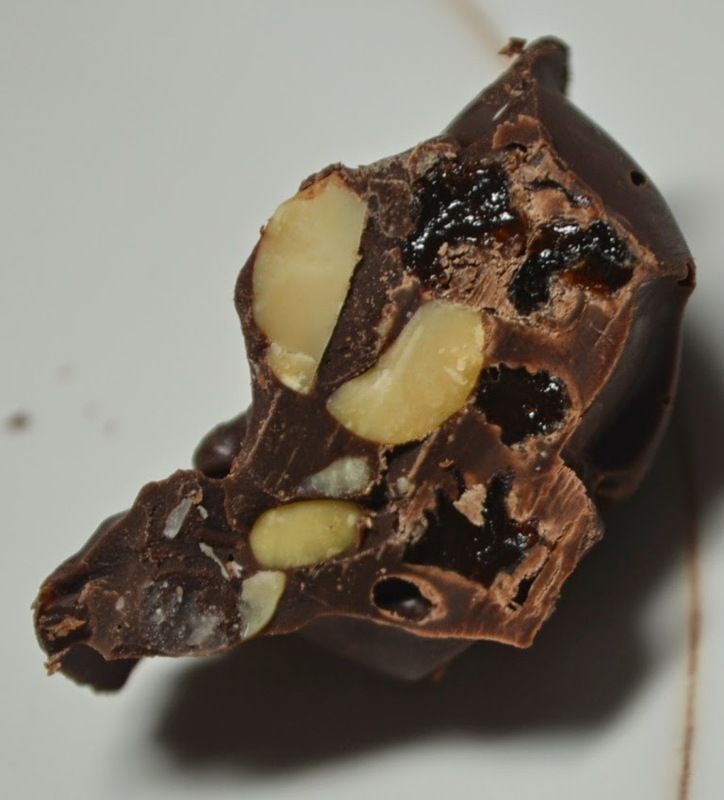 That's why I went with the dark chocolate, to (hopefully), balance the sweet of the dried fruit. Worked very nice. Could even go to a darker chocolate than I used. Yorick! I knew him well, Horatio! That looks so delicious. Fun to make, too. And I still love the lemon tart name for that room. Very cool. I love candies. They are my favorite. But i have not seen skull type of candy! They look different for me and i am so eager to taste it! Wow...just wow! You have me having a serious chocolate craving now! Friday Question: Home or Out? Friday Question: Chocolate or Lemon?